The Handy chair was designed during the 1960s by Illum Wikkelso. Turn your hands face up with pinkies adjacent. Bend your fingers into a cup while separating your second finger from your pinkies and middle fingers. If you can do this, you get the idea. The chair is also very handy to have in and move about the sitting room. Saddle chair design by Ejnar Larsen and Aksel Bender Madsen in 1959 Available in rosewood, wenge and cherry. The PD60 dining table combines centuries old detailing with centuries old timber in a clean, modern package that will last for centuries physically and aesthetically. A novel approach to engineering allows this all and only solid wood table to breath in during the winter and out during the summer without adverse effects. Paere Dansk makes this table in lengths up to 6 meters with only 4 legs at the corners using the table-length timbers’ own tensile strength. Available in rosewood, wenge, zebrano and others timbers in just about any size. 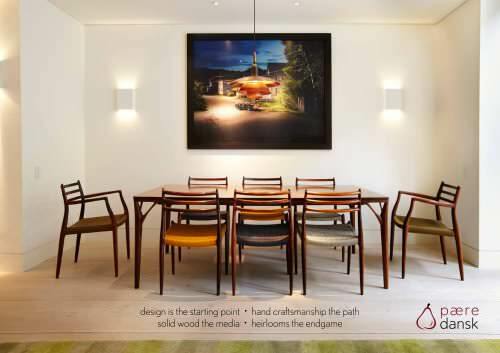 The PD55 table has an organic design that is at home in 1950s Denmark and in contemporary homes today. The branch like legs grow up from the floor and branch out to support the floating solid wood table top. An optional butterfly extension leaf sits under the table top and can be unfolded with ease to extend the table up to 280cm. Available in rosewood, wenge, zebrano and other timbers in lengths up to 280cm. The PD11 table has an Korean flavour without the tapering legs more typical of Danish mid-century tables. While rounded off square legs and edges put Paere Dansk at risk of being sued by Apple for copyright infringement for resembling the rounded square icons found on the ipad, the inlaid blond wood borders lend a esthetic structure and are not copyrighted by Apple. Niels Otto Moller designed and made his own pieces. Mastery of both fields led to timeless designs with subtle almost imperceptible detailing, best in class durability (after 50 years of use less than 5% of joints require regluing) and an ingenious seat construction that succeeds both aesthetically and ergonomically. This dining room set was made for Orupgaard Estate, Falster, Denmark, of which the main building was built in English style by the English Baron Charles de Selby in 1812. From 1840, Orupgaard changed hands until 1938, when it was bought by Danish industrialist Knud Hojgaard, who restored it to the English style introduced by Baron Charles de Selby and ordered tthis Brazilian rosewood table that extends to 8m to seat 24 chairs of solid Brazilian rosewood and wicker back.